Many people complain about how stale the formula for the main Pokemon games has become. Not a day goes by without someone asking for the series to change in a meaningful way. Thing is, given how stubborn Nintendo is with their franchises and how successful the Pokemon franchise has been, that’s like asking for it to snow if you live in southern Florida. As nice as that would be, it just isn’t going to happen. Your best bet is to turn to its spin-offs. We’ve seen several Pokemon spin-offs over the last decade. Some of them have been good, some have been decent, and some have just been absolutely atrocious. One of the more interesting games that have come out of this was Pokemon Pinball. This seemed like a sure-fire hit for me. I love Pokemon and I really like pinball. I never got around to playing the original iteration on the Game Boy Color, but I did get Kirby’s Pinball Land on the 3DS Virtual Console and recently snagged a copy of Pokemon Pinball: Ruby and Sapphire for the Game Boy Advance. 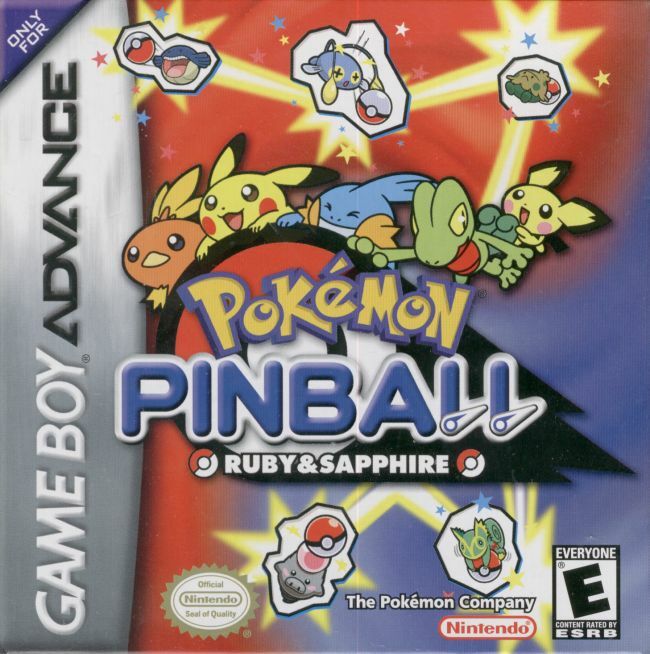 The pinball gameplay in Pokemon Pinball: Ruby and Sapphire is great fun. It’s fast, exciting, and getting a large amount of bonus points feels very satisfying. Similar to the main games, there are two different boards for you to choose from: the Ruby board and the Sapphire board. Both boards have different layouts that make for different experiences. As you score points, you can also get coins to use in the board’s shop, which lets you purchase multipliers or other special effects. This game also offers a save function that temporarily suspends your progress in the middle of your game. This function is very handy when you’re out and about. 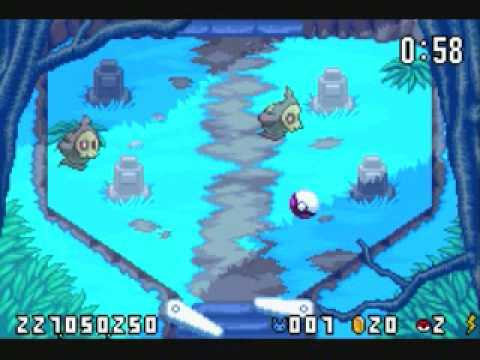 Pokemon Pinball: Ruby and Sapphire is one of the few GBA games that I know of that gains an extra feature when used in the Game Boy Player add-on for the Gamecube, offering rumble feedback if you play it in this manner with a wired controller (Wavebird controllers obviously don’t count). Since I still have my Gamecube and my Game Boy Player, I decided to try that out. This feature works decently well, but is ultimately not a deciding factor for whether I should play it on the Gamecube or my Game Boy Advance. This wouldn’t be a Pokemon game if there weren’t some way for you to catch them. You can catch Pokemon in three different ways: Catch ‘Em Mode, Egg Mode, and EVO mode. Catch ‘Em Mode has you hitting some bumpers on the board to reveal the picture of a random Pokemon. It reveals said Pokemon, you hit it a few times with your Pokeball, and it’s caught. Egg mode is activated once you get your Pokeball through the egg area enough times for a Pokemon to hatch, which wanders around the board while you try to catch it. EVO mode has you collecting three items so you can evolve one of the Pokemon you caught. Also, much like the main series Pokemon games, some Pokemon are exclusive to either one of the two boards. After you catch three Pokemon, you have the opportunity to go to a bonus stage to rack up some bonus points. This is one of the bonus modes in the game. For those of you wanting to catch ‘em all, this game will probably leave some of you a bit frustrated. While the “catch ‘em all” spirit of Pokemon is very much present in the game, actually trying to do that is incredibly hard. This was especially evident in the Egg Mode. More often than not, I ended up failing to catch the Pokemon because it kept moving around all over the place. But then again, I’m not exactly a pinball wizard, so I imagine more skilled players than I would have an easier time with it. Also, much like Pokemon Ruby and Pokemon Sapphire on the Game Boy Advance, Pokemon Pinball: Ruby and Sapphire doesn’t have all the existing Pokemon at the time up for catching. Out of all 386 Pokemon that existed during the third generation of Pokemon games, only 201 of them can be caught in this game. I could sort of understand why Ruby and Sapphire withheld most of the old Pokemon, but why Pokemon Pinball? Why not just have all the Pokemon available for capture? The Johto Starters, Aerodactyl, and Deoxys all make appearances, but they can’t be caught. I can’t exactly catch ‘em all if only a portion of them are available in the game. These problems didn’t really get in the way of my enjoyment of the game that much. Filling out your Pokedex is completely optional and, as I said before, the gameplay is lots of fun. I would’ve liked to see some additional modes, like multi-ball, but oh well. 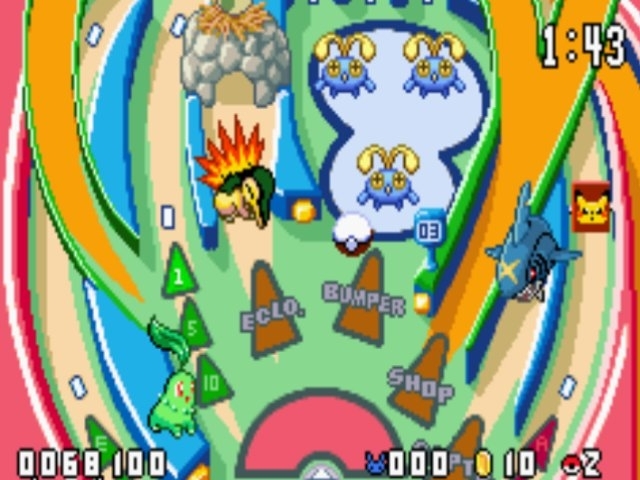 The pick-up-and-play nature of the game seems like a perfect fit on the eShop as a downloadable title, so I’m kind of surprised that Nintendo hasn’t taken the opportunity to re-release the original Pokemon Pinball yet. Until then, if you’re looking for some simple, fun pinball action with a dash of Pokemon, feel free to give it a look.